We all like our bikes to have that individual touch. And there’s no better way to achieve that special look that comes from a proper attention to detail than by adding some of Hope’s big range of accessories and components. We’ve got a special display case dedicated to the Hope products that tend to be most popular. So, why not provide some additional beauty and colour co-ordination to the bike of a loved-one? Who wouldn’t want to be given Hope this Christmas? Stocking fillers are sometimes hard to find. 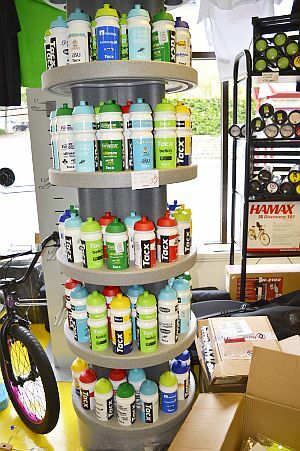 But our big range of Pro Tour team bottles is a great way to add that little extra present to the pile under the tree – we’ve got a massive range of bottles in team colours to match either your own team kit or, perhaps more importantly, your bike! Check out the big carousel of bottles in our main downstairs showroom. 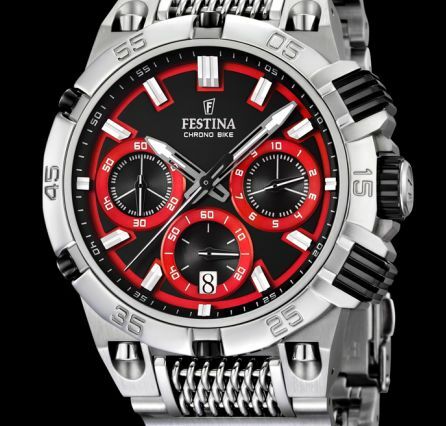 They are in stock now along with all the other gift suggestions on this page and it’s not too late to pop in and finish your Christmas shopping in one quick, stress-free visit! They’re a great way to remember the Tour’s visit and make an original and unusual gift for a cyclist. Riders featured include Mark Cavendish and Bradley Wiggins. Framed they are £84.99 (large) and £29.99 (small). Martin Cowton is a Ripponden artist and an enthusiastic cyclist. 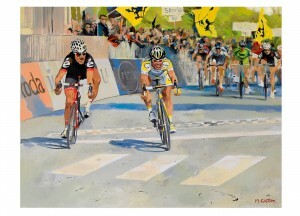 His work is inspired by watching the professional cyclists climb up the famous cols of the Tour De France. He never dreamt that one day a British Rider would achieve the unthinkable and win the Tour de France. Bradley Wiggins was the man to turn all British cyclists’ dreams into reality. Not only did he do this but he also won the Olympic Time Trial riding through the streets of his home city- London. 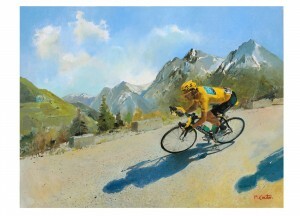 These events inspired Martin to produce a group of paintings to celebrate British cycling’s achievements. We love Velolove, they are so good at tapping into the cycling psyche with their range of T-shirts. They are also beautifully packaged. so, if you have a cycling mad relative or friend – and you’re not much good at wrapping presents – these are a dream gift! 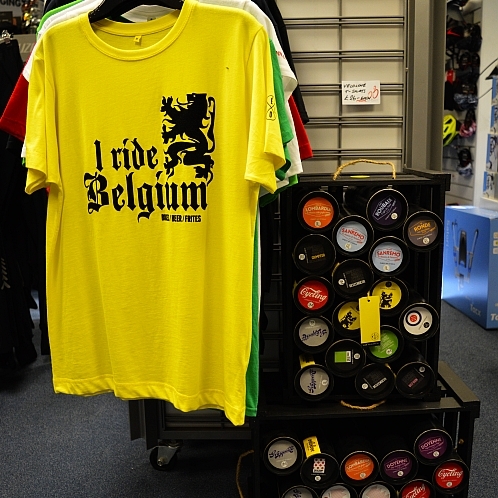 Pop into the shop today and have a browse of the many Velolove T-shirt options, perfect Christmas gifts! Here’s another of those cycling things you can’t have enough of. If you’re like us, we have several jackets on the go at any one time, with your latest purchase saved for “best” and an increasingly aged line-up of others you are less bothered about getting muddy and wet. 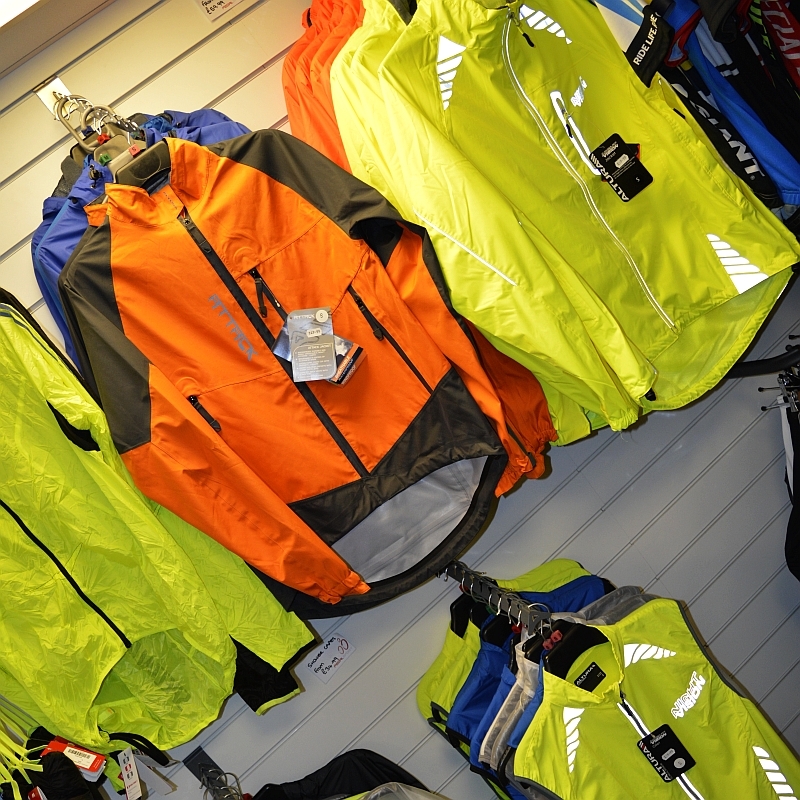 Christmas is a great time to slot a new “best” jacket into your outer-layer hierarchy (or that of the cyclist in your life). We’ve got loads of different options in stock, with some lovely women’s specific designs alongside all the usual men’s stuff. This is the kind of Christmas wrapping that really works for us! Gloves are one of Christmas’s gift cliches, but for the cyclist, riding, commuting and training in winter, they can be your most treasured piece of kit. 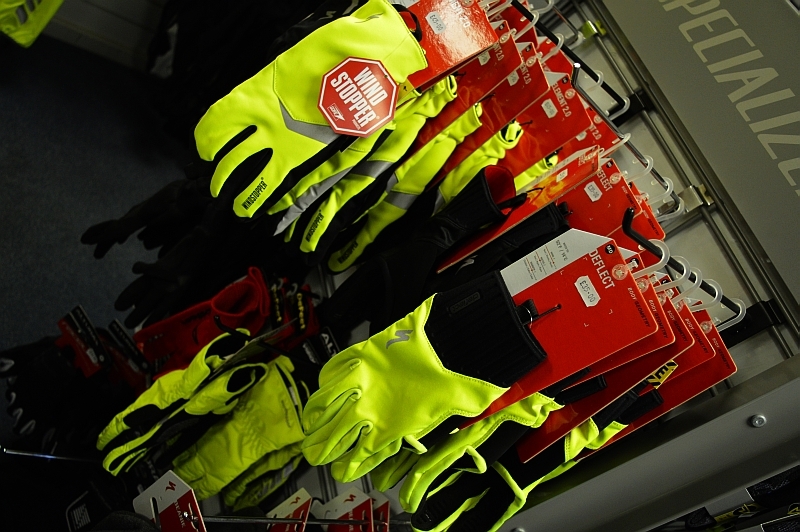 We’ve got a brilliant range in stock, from heavy duty waterproof gloves for long, cold winter rides, through to thinner full-fingered gloves for racing Cyclo-Cross or spring mountain biking and road, when feel rather than ultimate protection are the priorities. Whatever your choice, a top quality pair of cycling gloves is a world away from the knitted wooly gloves of Christmases past! 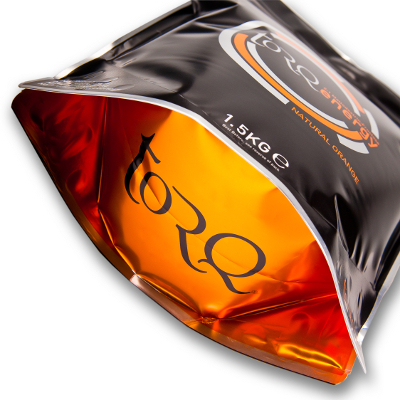 New in the shop in the last few weeks, a range of Torq’s nutritional products. We’re often asked to recommend drinks and recovery products suitable for cyclists, which is why we’ve recently expanded the range we keep in stock with some of Torq’s beautifully packaged Energy (naturally flavoured high carbohydrate energy drink, containing no artificial sweeteners, colours or preservatives) and Recovery ( advanced post-exercise nutritional drink formulation that has been designed to repair, recharge and refuel fatigued muscle tissue after heavy exercise) powders. Another great gift for the cyclist (or for that matter, runner, triathlete etc) in your life! As the chaps at Garmin say, their products “turn rides into races and riders into pros!” Well, we’re not sure if that’s entirely true, but with massive functionality (in other words they do a lot of things! ), Garmin’s many devices certainly have the power to add a whole new dimension to your cycling, with features such as live tracking, send/receive courses, social media sharing and weather, distance, speed, ascent/descent and GPS position, heart rate, speed/cadence and power and much more. 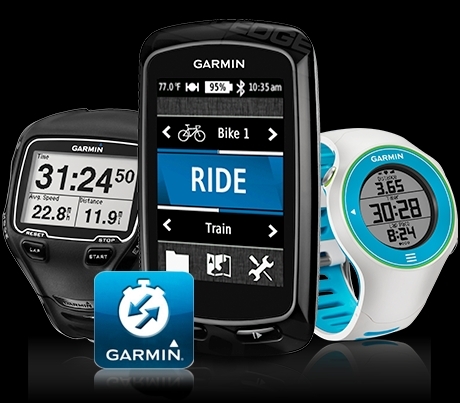 We have a big range of Garmin products and accessories in stock right now, ready for Christmas. Why not pop into the shop and have a look? Another of those cycling essentials you can never have too many of. We’ve got a huge selection of cycle lights in stock, ranging from simple “be seen” commuting lights through to powerful off-road night riding lights. 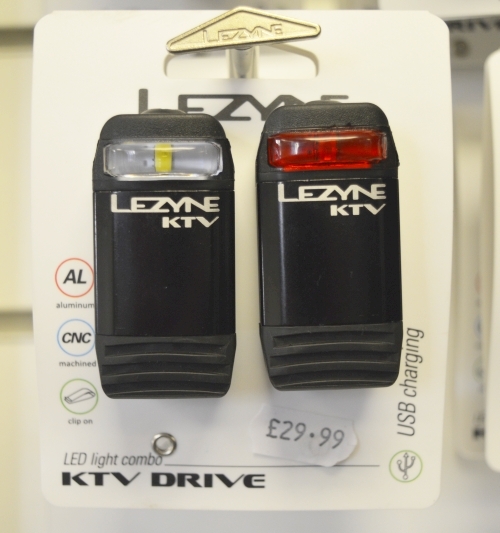 For this feature, we’re going to focus on these really neat lights from Lezyne. They really are designed to make you life simpler – they are rechargeable (via USB), so no fiddly & expensive battery changes, and with a clever rubber mounting clip, they can be attached to bars, stems etc in seconds. A lovely present for any cyclist! One of the great cycling essentials and these days aided by some snazzy packaging, pleasant smells and technologically advanced products, cleaning and lubing bikes has become a pleasure in itself. 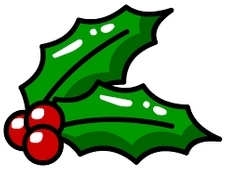 And, of course, these products are always welcome as gifts as they get heavy use at this time of year. So, why not put together a small selection, or buy one of the bigger “kits” and bring both a smile to you cyclist’s face and a gleam to his or her machine this Christmas? Another cracking Xmas gift idea that harks back to the Tour’s visit in July. These limited edition LOOK road pedals are the perfect way to finish off your favourite road bike. Top left is the carbon blade model at £159.99 featuring LOOK’s own iconic logo, so familiar to cycling fans all over the world. The other three are the Max Carbon models in the team colours of the Omega Pharma Quick-Step, Movistar and Tinkoff Saxo teams, which are £139.99 a pair. All these pedals are in the shop right now! 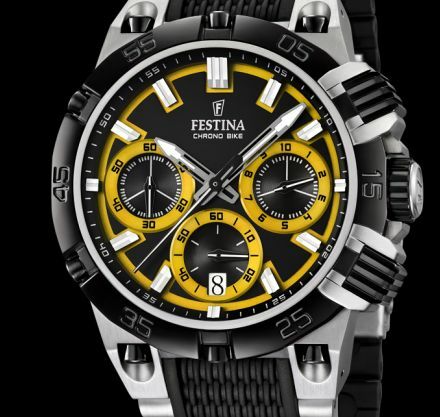 What better way to mark Christmas in the year the Tour came to our area than with a beautiful TdF Festina watch. 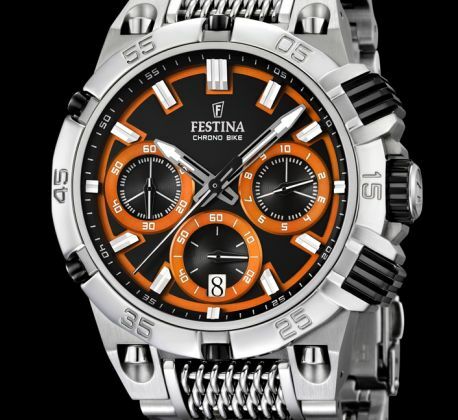 They’re lovely to look at and wear and feature some very smart cycling details, including chain link look-alike edges to the straps. On display in the shop today, opposite the counter!